No, it’s not a joke, but it’s not a beaver either. The fascinating creature in question is called a Mountain Beaver and although it is a rodent, the similarities with a real beaver pretty much end there. 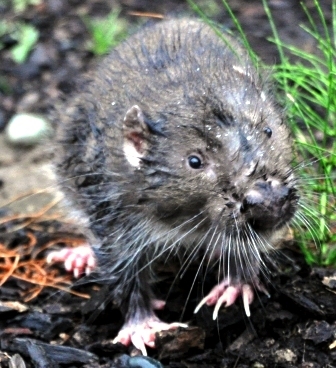 The Mountain Beaver, Aplodontia rufa, is a muskrat sized rodent of ancient lineage. Relatively common yet mysterious beasts, they are rarely encountered due to their subterranean existence and nocturnal dining habits. Most people are not even aware that the strange animal even exists. And thanks to a physiology that harks back to the early days of mammalian evolution they are almost exclusively residents of the damp Pacific Northwest. 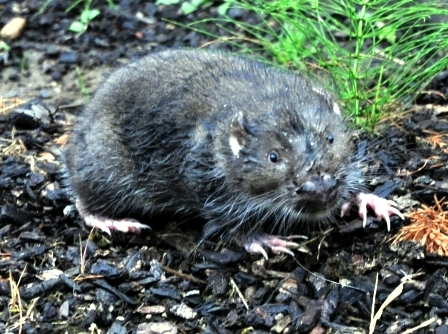 Also called a boomer or giant mole, the animal is a stout 12 – 14 inches long, and possesses a short, stubby tail. The tail, not much more than an inch long and tucked against the body, is pretty much invisible except on close inspection. 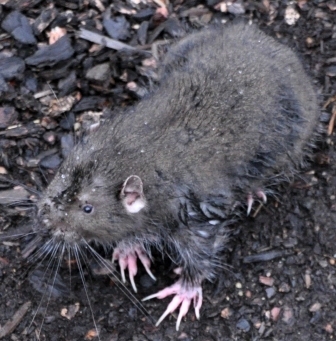 Most are brownish in color, but that varies to black with silvery tips. A pair of tiny black eyes rest above a large blunt snout and below a pair of quarter sized, mouse like ears. Perhaps its most distinctive feature, however, are the long clawed feet in front and back. If you have ever seen one of these guys those claws are probably the main thing that sticks in mind. Aplodontias are complete vegetarians and consume a wide variety of plants. Their extensive burrows are well organized affairs with specific chambers for food storage, raising baby Mountain Beavers, and waste. This predilection for succulent plants and large burrows sometimes causes problems with their human neighbors especially in regard to their taste for coniferous tree bark and seedlings. This feeding preference is most likely the source of their odd name, too. Sitting upright on its haunches an Aplondontia very much resembles a beaver and when you consider that most are found in high, moist areas of the Northwest the confusing name is understandable. Outside of their burrows Aplodontias are relatively slow. This is not a rodent that moves with the rapid lunges of a squirrel or bolts of rabbit speed. They sort of shuffle along in an almost comic fashion; it is quite easy to overtake one at a normal walking speed. At first sight an observer might even conclude that something is physically wrong with the creature and it may be in need of assistance. Don’t be fooled. That amiable gate is normal – and it absolutely does not match their personality. Mountain Beavers have a disposition more in synch with their forbidding appearance. And one look at those beady eyes, giant mole like body, and exceptional claws should be a more than adequate signal that this is not an animal that desires cuddling. Come too close and they will spit, hiss, lunge vigorously, and back up this display with an equally vigorous bite. I speak from personal experience. Perhaps the most intriguing aspect of this animal is its evolutionary history. These guys have been around, relatively unchanged, for forty million years. But our oldest rodent, this “living fossil” has retained some drawbacks along with this ancient physiology. Aplondontia kidneys cannot concentrate uric acid or store water efficiently among other associated problems. The animal does not pant or sweat; cooling the body is a problematic. The animal must therefore consume a large quantity of water daily and live in a cool environment. The Pacific Northwest meets those requirements nicely, thank you very much, hence Mountain Beavers prefer this area immensely. Although they do range from British Columbia and into California, the rain drenched Cascade Mountains of Washington and Oregon contain the bulk of their population. I was fortunate to run into the fellow in these pictures right on my property one morning; and for the most part observing these interesting animals is more a matter of good fortune than is the case with other species. But you can increase your chances by scouting out the right habitat at the right time. The rainy foothills of the Cascade Mountains is a good place to start and although they do occasionally prowl the ground during the day, nighttime is your best bet.